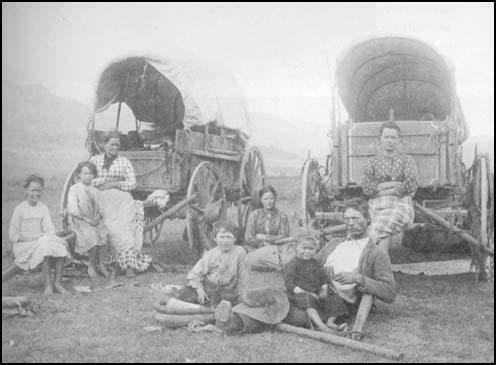 Most emigrants used light covered wagons with sloping sides. The canvas top was waterproofed with linseed oil and stretched over a framework of hoop-shaped slats. Although mainly made of wood, iron was used to reinforce the wagon at crucial points. However, iron was used sparingly in construction since it was heavy and would slow down and exhaust the animals pulling the wagon. The wagons were packed with food supplies, cooking equipment, water kegs, and other things needed for a long journey. These wagons could carry loads of up to 2,500 pounds, but the recommended maximum was 1,600 pounds. There was little room in the wagon for people and so only small children or senior citizens rode in the wagon. The rest of the party walked beside the slow moving vehicle or rode on the back of a horse. The emigrants used horses, oxen and mules to pull their wagons. The most popular animal with emigrants was the ox. It was cheaper, stronger and easier to work than horses or mules. They were also less likely to be stolen by Native Americans on the journey and would be more useful as a farm animal when you reached your destination. Oxen were able to exist on sparse vegetation and were less likely to stray from camp. The main argument against oxen was that they could become reckless when hot and thirsty and were known to cause stampedes in a rush to reach water. Between 1840 and 1860 more than half of the animals used to pull the wagons were oxen. Probably the major reason for this was that an ox cost $25 in the 1840s whereas mules were $75. During the early stages of this migration, mules were the second most popular animal with the emigrants. Later, horses replaced mules as the second choice for pulling wagons. When the party stopped for any length of time the wagons were arranged, end to end, in a circular or square compound. This served both as a corral for the animals and as protection against a possible attack from Native Americans. When I arrived in St. Louis, we went to work to get the necessary equipment together. Most important of all, we had to have a strong wagon and at least two teams of oxen. We bought the wagon without framework and covering for fifty dollars. It was a good wagon which stood the trip well. Ripstein had bought two teams of oxen on the Illinois side of the river for twenty-five dollars each, but one team was too heavy and too old for such a long and difficult journey. Therefore, upon the advice of everybody, we exchanged it in Independence for a much younger and also much cheaper team. To strengthen the wagon tongue, we had an iron rod attached along its entire length, and, thanks to this arrangement, the tongue did good service. Our wagon was, of course, outfitted with a framework and a covering of oiled canvas. There were five of us in all, of whom I was the youngest, who were going to take the trip together in the same wagon. We found St. Joseph after nearly two months' steady tramp and solid tread of the honest old oxen, a sea of tents. For miles and miles up the Missouri and down were to be seen the white tents, white covered wagons and busy people passing and surging to and fro. It was now the middle of May. The weather was warm and we could sleep in the tents instead of the covered wagons. So we rested here for several days while papa purchased food and other things that we needed. We had two big heavily laden wagons, with eight yoke of oxen to each, a carriage and two horses for mother and baby sister, and a single horse for the three boys to ride. This was particularly convenient, especially at the crossing of the swollen streams, when all three could climb on together and get lots of fun and often times a little wetting; for we all had learned to swim in the dear old Tippecanoe, and we did not mind a bit if we all rolled off together in the middle of the stream.